Just how the Honolulu Marathon began the long vacation in Hawaii for me, the HURT 100 Mile would be ending it. It is also difficult to begin writing these blogs and I also get a little anxiety because I know that through my scattered thoughts and sentences that come out, won't be able to completely reflect the experiences and memories that happened, especially for this. I ended up having this opportunity to crew/pace Adam Schwartz-Lowe at his 100 mile race from Brian Peterson linking us up. It is kinda funny how small the ultra world seems with the more people you meet. Brian and I were just talking during one of the Hyland Friday loops and he told me that his friend Adam was going to be running the HURT 100 Mile. I guess there are not too many people out there that get much pleasure out of running 100 miles. Regardless, I was giving the opportunity to crew/pace for the first time and I was super jacked. The race was on Saturday January 15th and I ended up meeting Adam and his wife Amy at the pre-race meeting the day before the race at the Hawaii Nature Reserve. There was a ton of energy seeing 100+ people that would be starting to run 100 miles within the next 15 hours. It was also fun getting to speak to many of the runners and hearing of other ultra races they have done. Some wild people in the ultra world, that’s for sure. Met up with Adam and Amy at the park reserve and went back to their condo in Kailua where they were staying for the time in Oahu. Seeing Kailua was totally different then the last month and half I had spent in Waikiki with my sister Kayla and her boyfriend Kyle. Things were much more laid back, not too many affluent tourist running around buying things, and it was a total different feel. After hanging out at the condo for a bit, we decided to check out a place Amy had found in the Oahu guidebook called Pinky's Pupu's. We got a pupu (appetizer) of Kailua pig quesidillas, Adam and I each had a plate of pasta and Amy got a dinner plate with rice and mac salad. Having lots of questions to ask Adam about all of his previous races, I pestered him with whatever questions came to mind and listened intently as I am interested in getting into the ultra-world myself. He told me about his other 100 mile races, including the Western States which was actually the first 100 he did, and briefly talked about the Gnarly Bandit series(he was the only one to complete this in Minnesota). 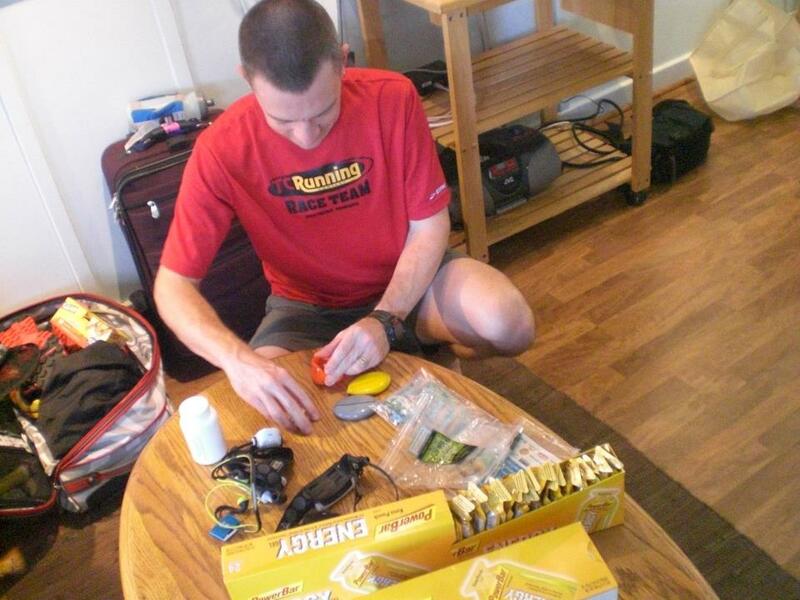 After finishing eating up getting back to the condo, Adam began to do his final preparations for the race. He laid out a lot of his supplies, including the 72 power bar gels that he would be taking throughout the 100 mile race (I haven't been able to stomach more than 10 in a race before). It was pretty cool seeing how structured and planned out he had everything, with supplies for just about anything that could happen during a race. He had things like Salt-Caps, Bodyglide and other anti-shaffing sprays, ginger candies, extra shoes, ice bandanas, and a ton of other stuff. This definitely showed me how much planning and preparation should be done when doing these types of races. In the past you can say I have kind of winged my "ultra" distance races of 50k and 50miles by just eating what the course aid-stations offered and luckily haven't ran into any GI problems..yet. Before doing a 100 though, I will need to get more structure in my nutrition because I don't think my current habits will fly with that long of a race. (Saw a few people puking throughout the course and probably can guess it had something to do with their fueling during the race. As Adam was getting his final things ready, Amy and I went to the grocery store to get some food for us throughout the day while we would be crewing him at the 3 aid-stations. We got things for turkey sandwiches, almonds, and curry quinoa! Want to start in quinoa more often now. Was pretty cool to see that Amy was also health conscious with the foods she got, as it makes eating healthier much easy for me. We got the groceries and headed back to the condo. With needing to wake up at 4:30am, lights out was at about 8:30pm and laid down in the couch with so much energy and excitement, only imagining what Adam was feeling at the time. Woke up with Adam saying something silly like "good morning sunshine” and that was all it took to snap me out of a sleepy mind. I def consider myself a morning person, especially when there is something exciting to do, and at this time, this is nothing I would rather be doing then getting to experience what a 100 mile race was like. I have volunteered at many marathons before and ran several before, but many times during the race I think to myself how cool it would be to simply spectate a race, and this was what I had the opportunity to do for a whole day, before it was my turn to start running with Adam. Adam stated how he was nervous for the race, and with this being his 6/7th 100 mile race, I'm guessing that is a testament to how grueling these races truly are. We drove in the dark early morning about a half hour to the starting point at the Hawaii Nature Center and were welcomed by a very lively crowd at about 5am. This reminded me of how much energy was on the bus for the Superior 50 mile as we were bussed to the starting point. Not many things are more energizing than seeing all these people ready to seriously HURT. and within a few minutes and grateful words from many of the runners, they were off into the early morning. From here Amy and I would be driving to the next aid station Paradise Cove where Adam would be coming after about 7.5 miles. Saw the first few guys and a lady come in to the aid stations and was interesting to see their different strategies. Some had hydration packs and would leave the aid station quickly, others relied on a single water bottle. 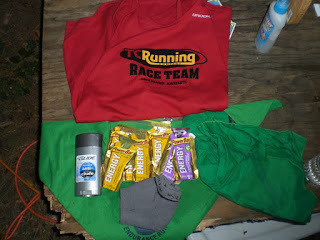 Adam would be coming in with a hydration pack and would need 5 gels to be restocked in it. Here is a pic of the setup we would generally set out for him. I was pretty nervous for the first time he came in because didn't want to mess something up or slow him down at all, as he likes to get in and out of the aid-statoins as quickly as possible. After seeing him in good shape at the first aid-station he was off onto the next 5.something mile stint where we would meet him at the Jackass Ginger aid-station. 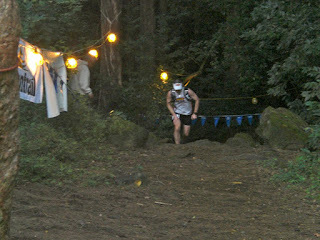 To get to this aid-station the runners had to cross a creak across stones with the aid of a rope, and then up a hill. Even though we would be doing the same thing throughout the rest of the day, it was always exciting. I guess sympathizing with what Adam was going through, and what he still had to go through, it always left me on my toes thinking about what we could do to help out more. It was a real feeling knowing that people are royally struggling out there, yet all pushing through so many mental/physical barriers. We did this cycle of the aid-stations, Nature Center, Paradise Cove, Jackass Ginger throughout the day until about 9pm when he was finishing up his 3rd loop at the Hawaii Nature Center, where I would begin running with him. It is WILD to think that up to this point he had already ran 60 miles throughout that time frame of Amy and I driving between aid-stations, hanging out and eating, and checking out a Japanese bakery(yum). Through the whole day, I had been looking forward to running with Adam, and getting to see what the course looked like besides from the outside perspective that I had as his crew. My only account of the trail was the pictures that Adam had sent me before the race, and the small sections that Amy and I had hiked while waiting for Adam at the aid-stations. I was also pretty nervous because although he told me to run however much I wanted to, I felt the need to prove my adequacy to him. Knowing that he got 2nd place at the Superior 100 mile, this was even more intimating for me. Got to lay down for an hour or so before he got to the last aid station at night, however with the attempt of catching some sleep before he got there, this proved to be impossible. 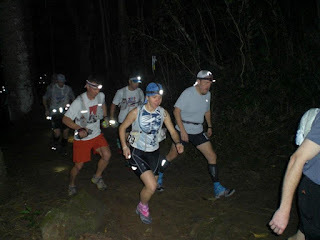 There would be other runners coming into the aid-stations and I would perk my head up every time to see who it was and couldn't believe how much work they already did, along with how much work they still had to do. The runners already ran from the dark early morning to the dark night, and now would be running throughout the whole night. I changed into my running clothes and waited anxiously for Adam. I was super excited to be able and experience what he had been and try and help out however I could. Not super sure of what my role of a pacer was, I just tried to make sure he was doing fine and try and keep his mind of the fatigue. It helped that for our whole first 20 mile loop, we were with another runner, Jaime who had run maybe 30 other 100s so it was nice to hear what kind of conversations seemed to go well for them at that point. They talked about many races they did in the past and I couldn't believe how much they knew about each others races. Again, another example of how connected the ultra world is. Jaime even talked about how he knew Brian Peterson from the Cascade Crest 100 mile, although he was from another state. It's funny how 2 runners who have never met before, can meet in a race and have more in common than many of my other friends that I've had for years. 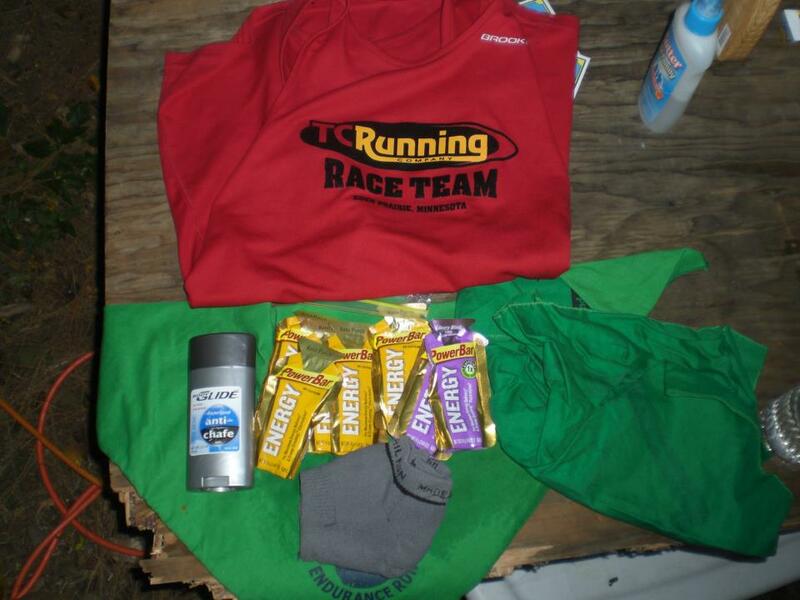 Ultra running sure creates quick bonds between people, especially 100 mile races. We would get to the aid-stations and I would either take Adam's pack and fill it up with water, or restock his gels for him and during the first couple aid-stations, I kind of forgot to hydrate myself as much as I should of for only caring a handheld water bottle in-between the aid-stations. Knowing I wouldn't be able to pace very long if I kept this up, I had to tell myself to put more time in for me at the aid-stations, especially with how quick Adam liked to get out of there. This was pretty consistent with what Brian and Kurt and told me before the race, that you think about your runner so much, that you kind of neglect yourself. With having Amy there to help Adam at the aid-stations I was able to slam some water/succeed at the aid stations and grab some food. After the first 20 miles, my legs were pretty dang tired and could not even slightly imagine what Adam's legs felt like after doing 80 miles of this. Hah He seemed pretty tired mentally (as he should in the middle of the morning after running for so long, but his legs just kept on moving. We did have to do a bit of hiking, because of the gnarly terrain and giant roots not being very conducive to running. My ankles were feeling very unstable and sore, from never running on stuff like this and I was getting nervous to ask Adam if I could check-out after mile 33 before the last leg of the race. I was thinking of ways to bring this up to him but and after asking how much he needed me for the last stint and him kind of gesturing to me that I could quit if I needed to, I decided to just finish it out. It's funny that he was able to tell that I was getting tired, despite how tired he was at the time, and kind of embarrassing for me to have him addressing my issues, when it should be the other way around. With these thoughts in mind and even though the last 5 miles felt like it took ages, I decided I would regret too much if I didn't at least attempt to do the last 7.5ish miles with him. It is motivating to know how much pain he had to be feeling at the point, and that allowed me to push much further than I would have been able to just on my own or with a friend who had been doing the same distance as me. After seeing other runners having hiking poles, we ended up getting hiking sticks (bamboo sticks) to help us on the gnarly rooty uphills and downhills. People have told me that crewing at a 100 mile race is a great way to see what it is really like and boy did I get to learn a lot. My motivation for running a 100 has increased 10fold, despite not being able to perceive the difficulties that lie ahead, but I guess that’s what it was like when I signed up for my first marathon. I am very excited for the running adventures that lie ahead of me, and also the people I will get to meet along the way. Currently am in a little debate with myself if I want to fully hop into the ultra-world or if I want to try and get a faster marathon time. Because my marathon time is mediocre at best, I am interested in testing my luck with a 100, but it would be cool to be able to bust 3 hours for a marathon. Still need to decide whether I want to try and break 3 hours at Boston which is 88 days away. If I do, it will take a lot of time and structured training but what else do I got to do..study? I’ll pass on the latter choice. Dude, epic adventure. You have got me so excited!